Norway’s Foreign Minister Børge Brende meets with Sergey Lavrov in Russia’s northern city of Arkhangelsk. Børge Brende landed in Arkhangelsk Tuesday evening and will have bilateral talks with Sergey Lavrov on Wednesday followed by a working dinner with the Russian Foreign Minister and other Nordic foreign ministers. Brende and Lavrov disagree on much, but can again exchange smiles for a common understanding of joint interests of maintaining dialogue in the north. “Northern regions and cooperation in the Arctic is of high priority for Norway. Russia is an important partner and player in the Arctic, and the conference in Arkhangelsk provides a good frame for continuing the political dialogue with Russia regarding questions of common interests,” says Foreign Minister Børge Brende. Brende is not traveling alone. The foreign ministers of Denmark and Iceland, Anders Samuelsen and Gudlaugur Thór Thórdarson are both in Arkhangelsk. For the Nordic countries, a coordinated voice makes it easier when political talks are to be reestablished after the longest post-Soviet period without visits to Russia. Børge Brende’s visit to Arkhangelsk is the first to Russia since Moscow’s annexation of Crimea three years ago. Although little political contacts over the last three years, cooperation between Norway and Russia in the north have been going on in areas like fisheries, border control, environment, nuclear safety and the broader people-to-people contact networks between Murmansk, Arkhangelsk and northern Norway. 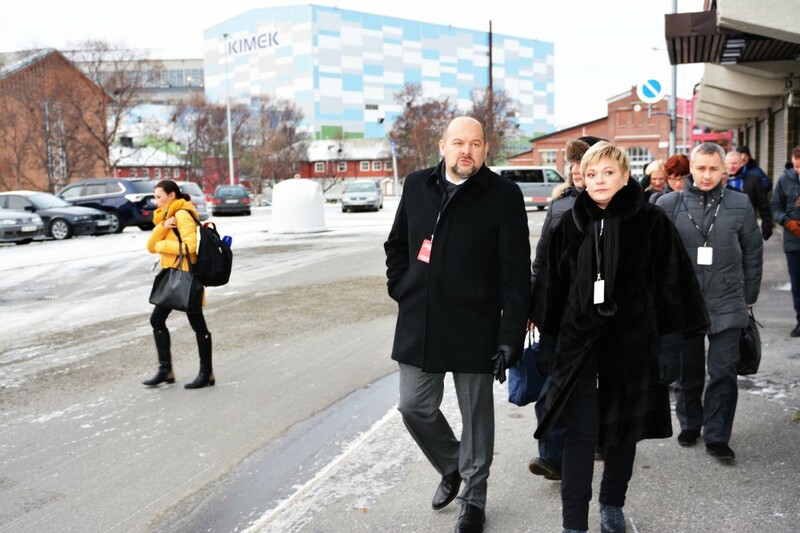 Highlighting the regional importace of the two countries cooperation, the Norwegian Foreign Minister will meet with both Murmansk Governor Marina Kovtun and Arkhangelsk Governor Igor Orlov. First speaker at the opening session of Arctic Forum is Russia’s Vice-Premier Dmitry Rogozin. He is not a highlight in Norwegian-Russian Arctic cooperation. In April 2015, Rogozin suddenly landed at Longyearbyen airport on Svalbard, went to Barentsburg, before flying further north to Russia’s Barneo ice station near the North Pole. Rogozin is banned from Norway under European Union sanctions against him over Ukraine. Although not member of the EU, Norway follows the same sanction regime. Well back on the Russian mainland, Rogozin started to post ironic tweets. The Barents Observer was the first to write about Rogozin’s surprise visit to Svalbard. The Vice-Premier linked the Barents Observer article and different Russian media-article on the Norwegian reactions to his Svalbard visit. He tweeted Просто завидуют, что мы на Северном полюсе купались …(Just jealous that we were swimming at the North Pole). A second tweet said После драки кулаками не машут” (“After a fight, its too late wawe your fists” in the understanding “No use to cry over spilt milk” or “The bus is gone”). Børge Brende shortly afterwards summoned the Russian ambassador in Oslo to express frustration over Rogozin’s visit. Moscow, however, said the visit to Svalbard by the deputy Prime Minister was fully within the norms of international law and the Svalbard Treaty. It is not known if Svalbard, and Norway’s stricter entry rules to the archipelago introduced after Dmitry Rogozin’s visit in 2015 will be debated in Arkhangelsk. The conferance in Arkhangelsk is entitled “The Arctic: Territory of Dialogue”. Here is a link to the program where the big highlight will be a speech by President Vladimir Putin on Thursday afternoon.